After a record number of submissions this year, the votes are now in and the lines are closed. This year, once again Whitechapel Gallery’s Kirsty Ogg joined a panel of esteemed judges including Matt Williams from the ICA, Turner Prize nominee Paul Noble, curator Michelle Cotton, journalist and broadcaster Miranda Sawyer and our very own Francesca Gavin and took to a room for a day to argue the case for their personal favourites out of the 1,600 who submitted. The final five artists will exhibit in the Converse/Dazed Emerging Artist Award exhibition at Londonewcastle Project Space in October 2013. Joey Holder’s glowing fishtanks and aquaeous installations won out in the judging process. In her natural-world-meet-rave aesthetics, she combines ‘so-called ‘organic’ and ‘artificial’ substances and surfaces through a series of abstractions’, creating ‘a world of manifold layers’. 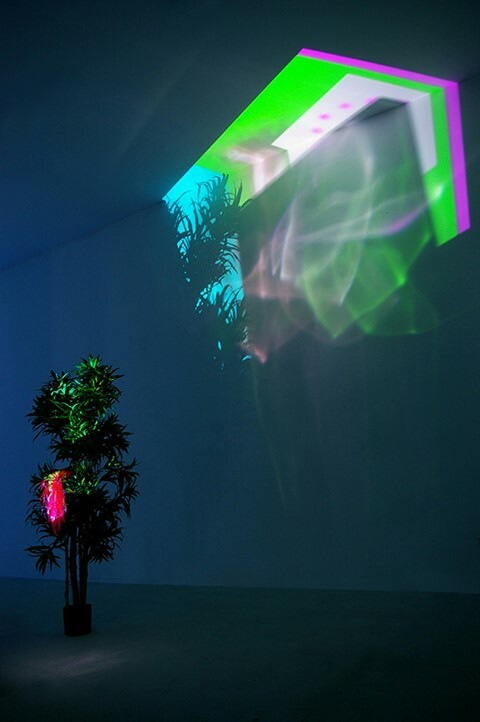 The seductive installations use UV light, projection, videos and digital manipulations to fuse natural and synthetic form and colour. Titles such as ‘Eating a Tube Anemone’ and ‘Progressive Rock’ describe works that count among their materials fake plants, sealife videos, glass bricks and hair extensions. Holder has been organising and exhibiting non-stop since she graduated from her MFA at Goldsmiths in 2010 and has shown at Nottingham Contemporary and the Digital Art Biennale. Her current exhibition Mutagen is on show at ASC Gallery. It feels out-of-date to call myself an artist whose work spans many different medias. I paint, sculpt, make video, multimedia installations and have numerous blogs and image streams. My work seems to be about how these things are networked together, how they are set in ‘constellation’ – its about the 'tissue' which connects them. The very 'human' way in which we make sense of the world is to name, structure and hierarchize things, yet these systems are always in flux. In my work I mix elements of biology, nanotechnology and natural history against program interfaces, screen savers and measuring devices. I see no object or substance in a fixed state; everything is always transforming and morphing into something else, nor do things having a permanent definition, identity or order. I don’t adhere to fixed states of ‘purity’ - everything is a mutant, a hybrid and the speeds which these travel and transform can been seen more clearly through the journeys of images, texts, films and stories through the internet, mass media and technology. What is the main thread you keep returning to? I am interested in what we consider ‘natural’ or ‘artificial’ or rather ‘natural’ or ‘manufactured’ and how these poles are being progressively blurred. I don’t believe there is any separation between these terms and what we produce as humans is actually part of nature's whole. The abstracted subjects of my work are often creatures or forms which maybe considered ‘alien’ or ‘unnatural’, which don’t seem to fit within the fabric of our usual day-to-day existence. I compose and contrast these so called clashing elements to make stable configurations and hyper-aestheticised display systems. Do you have a specific process when you begin working on a project or piece? What was your last exhibition? MUTAGEN ϟ at ASC Gallery, London - with artists Josephine Callaghan and Vicky Wright. I would travel to Palau to research the different species of 'Nudibranch' that live in the waters surrounding these islands. Languages and forms appropriated from sources as diverse as Yvonne Rainer and poetry slams, Faye Green’s complex performed texts sit comfortable astride words, action and narrative. her work , NOT TO DISCOU[RAGE] YOU is an exploration of the ‘illicit learning of a forbidden dance...a delicate thievery, a swallowing down into the belly... the remnants of a dance unseen, undanced, but held in the body like a fever’. She has just graduated from Fine Art at Newcastle university and studied for a year at Concordia in Canada. What is your work about and what makes it different? I am endlessly fascinated by mimicry, the body, and the performative operation of text. My work explores the kinds of knowledge that can be held in the body, and how these can be spoken about. I am interested in the interplay between discourses...my performance work moves towards an enactment of these dialogues, a making-visible of these processes of pursuit, towards an embodied practice of research. What were your last pieces? The last work I showed was a sleeplessness is occurring, a collaborative piece made with Beth Ramsay. It is a live work that emerged out of a conversation about bodies. The piece takes a series of actions and disperses them, separating cause from effect, call from response. The energy of the piece remains in flux, as the two performers move in and out of synchronicity with one another . in endless affective combinations of the same actions. Moments of mimicry, a sudden “making-sense”, flashes of contact, dissolve and scatter as quickly as they form. What will you make for the exhibition in October? For the exhibition in October, I will be working on apiece called NOT TO DISCOU[RAGE] YOU. The work exists as a solo performance and as a written ‘Score’, which acts as both a remnant of the live work and an incitement for its possible re-enactments. NOT TO DISCOU[RAGE] YOU surrounds the illicit learning of a forbidden dance. This learning process is not only marked by the obstructions of the dance’s protected legacy, but also by the particularities of the learning body. When the live site, the embodiment of the dance – the dancer! or thief, has left the room, only the written score remains, as an incitement for another reading, another learning, another body to begin again. As I graduated very recently, my priority is to sustain momentum within my practice, and challenge myself and my work as much as possible. The experience of being part of the Converse/Dazed group show could potentially have a huge impact on the possibilities open to me as an emerging artist. So, although I could say what I would do with the prize money right now – funding projects or residencies, buying a video camera(!) – winning the title would hold so many unknown and exciting prospects that I feel like it’s almost impossible to know! By far the most unusual portfolio - a full laptop and joystick set-up - Ben Washington submitted a digital environment. Using one-person adventure game tropes, Washington installs computer designed environments in arcade style booths, placing them within the gallery context alongside objects and creating a ‘spatial feedback loop’. His interest lies in ‘rendering tangible space’, and his journey through the ‘game’ world moves the viewer through his virtual gallery space; objects appear in both - rendered, designed and created by the artist. The distinction is in the senses. Since his BA at Kingston University in 2004, he has exhibited at The Nunnery and Waterside Contemporary. My work is a combination of sculptural and collaged elements that are linked together through the way in which they are devised and realised using 3d graphics. Recently I've begun to create direct crossovers between the sculptures, collages and the 3d processes by using homemade arcade boxes that let the viewer enter and explore the 3d environments created whilst making the collages and sculptures. The main thread I keep seeming to return to is of how we understand and engage with the spaces we inhabit and of how the objects, architectures and forms we place within those spaces in turn shape our view of the world. The things that inspire my work can range from the stylings of old computer games to the layouts of medieval Cathedrals, but quite often they are elements of Landscapes or Architectures that in someway define the space around them in a striking or unusual way. There is quite a back-and-forth process involved in my work, with objects and images constantly flickering between different types of space; the real, virtual, imaginary, 2-dimensional and 3-dimensional. This cyclical nature can sometimes make it quite hard to pinpoint where the process begins or ends. What makes your work stand out / different? I suppose the fact that the work allows the viewer to explore the 3d spaces that I create is the main thing to make the work standout. Making a bridge between the real world and virtual representations of it gives the viewer a different kind of autonomy in how they experience the work. I'll be making work that allows the viewer to engage as much with the virtual spaces i create as it does their sculptural counterparts in the real world. Invest it back into my practice. A recent graduate from the Royal Academy, Faramawy makes videos and digital animations often blending computerised images between screens, plinths and prints. One of the works comprising his graduate exhibition was titled ‘Liquid Sunset’, and allowed the viewer to download ‘computer generated liquid embedded with footage of a sunset’ and own a piece of artwork that instantly appears on their desktop. Over the course of his degree he exhibited in Chimera Q.T.E at Cell Projects curated by Attilia Fattori Franchini and worked with Rhizome and Fact as part of the Liverpool institution’s ‘Unexpected Guest’ programme. The body, what surrounds it and what it means to represent and mediate it. I guess my graduation from the Royal Academy was the last show, but I was in a group show at the same time. It was called Abstract Cabinet and was at David Robert’s Art Foundation. Before that I was in Chimera Q.T.E. at Cell projects with some screenings and online works in between for the Oberhausen Film Festival. How would you spend the prize money? Using techniques including marbling, textile pattern, pillar painting and collage, Newby explores pattern and image, often layering objects with colour and material so that they spill out from the architectural gallery features. His processes are enacted as a way of processing the mediated world around him. Interested in ‘objects in need of further subjective clarity’, Newby looks for items that allow him to ‘oscillate between one’s experience of it and it’s plasticity’. He completed his MFA from Glasgow in 2009 and has since exhibited at the Palais de Tokyo in ‘Le Club des Sous L’Eau’ and been awarded a Florence Trust residency. Generally, I would like to think that the individual works are usually able to back up a set of ideas that I find myself interested in, primarily issues pertaining to my direct environment, but more often than not I think they require the company of each other. They've lately tended to lean into notions of connotative narratives within interior spaces, i.e. flats, public spaces and the individual items that inhabit them to control or suggest mood and taste. Over the last 10 years I think the starting point for most of the things I've made involve the projection of a kind of intuitively charged dramatic space... The subjective platform used in staging any current issues or interests. The rest feels like a kind of pageantry or set dressing for a set of arrested narratives. Lately I think the most direct influences are those within my direct environment. Mostly things within a domestic setting. I realise this a pretty heavily trodden path but I feel I can only extend myself as far as the ways and means in which I furnish my own domestic sphere. This isn't intended as a egoistic approach but more to anchor the ideas to something that doesn't just exist within the realm of speculation but of my habits and movements and ways of viewing and interacting with the world around me. Accumulation. Not necessarily of things but every body of work has its own slow burn. Sometimes I think I'm going to have a cut and dry approach; planning followed by clean execution. This usually isn't how it works out but in the end seems to work out just as well and usually leaves unfinished business for later work. The work always seems like its some kind of mind map of influence like you might have in school or something but at the end of the day I reckon some people might relate to nuances within that that depict a larger idea; that thread you extract from the myriad stimuli one encounters regularly, read really really fast, inevitably missing something and then exhaustedly obsessing over that fragment. I was coincidentally asked to make work for two shows in Paris during the Nouvelle Vague emerging curators programme. The first one was at the Palais de Tokyo and the other at a place called Galerie Alain Gutharc in Le Marais. The first was a kind of tribute and reenactment of Jean Painlevée's Le Club des Sous l'Eau and the other was guided by domestic interests related to the curators flat in Mexico City. I've been making work that tries to single out formal and design elements of objects associated with interior space. This can generally mean that I'm trying to engage elements of textile design, furniture, or other ubiquitous constants similar to these as active agents of narrative, allowing connotative properties to aid the viewer with potential subjective fictions. In short, the charge of the movie poster without the insolvency of the plot.